The Curator of Intestate Estates and his deputies were required by the Intestacy Act of 1877 to publish a return twice each year in the Queensland Government Gazette of all the estates administered by them during the preceding six months. Although the Act required the returns to be published in the Gazette in January and July, they were actually published in a variety of months but rarely in January or July. On occasions the return for one or more divisions was not listed at all for the half-year. 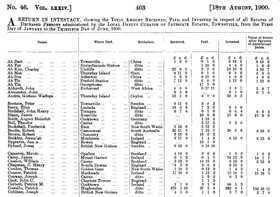 This database is an index to these returns in intestacy for Queensland during the period 1896 to 1916 - listing a total of 31,347 entries. Aliases, where listed, have been indexed. Although the half-yearly returns commenced in 1877, this index covers from 1896 since from that year additional information on the deceased person was provided in the returns. "What information can I find on this index?" This collection includes only transcripts of entries found in the Queensland intestacy returns index. Birth place – There are many birth places outside the expected Australian states in this collection including, in part, England, Scotland, Ireland, China, Canada, Germany, and Italy. Death place – While the estates were administered in Queensland, the death place could have been outside the state. Included in this collection are various towns in New South Wales, Tasmania, Victoria, Western Australia, and South Australia, as well as towns in Ireland, England, and Scotland and other places such as China, Portuguese East Africa, and the United States. Interstate and overseas locations are often listed without any indication that they are not in Queensland. Usually it is easy to recognise such towns, however it should not be assumed that just because there is a well-known town or city outside Queensland with a particular name that there was not also a town in Queensland with the same name. For example, the index includes many references to Geraldton, this was the former name of Innisfail and should not be confused with the town in Western Australia of the same name. Court responsible for administering the estate – There were three districts of the Supreme Court during the period of this index: Southern District (Brisbane), which commenced in 1857, Northern District (Bowen/Townsville), which was established at Bowen in 1875 and later transferred to Townsville in 1889, and Central District (Rockhampton), which commenced in 1896.